These are great for wearing for an entire chilly ride or they are easily removed once it warms up. FABRIC: Thermal Microfiber - high performance stretchy sport fabric that is lightly brushed on the inside of the fabric for added warmth. This is considered a midweight fabric--heavier than regular bike jersey material but lighter than a thick fleece fabric. Arm warmers are machine washable. --Elastic grippers at top of arm to help keep arm warmers in place. 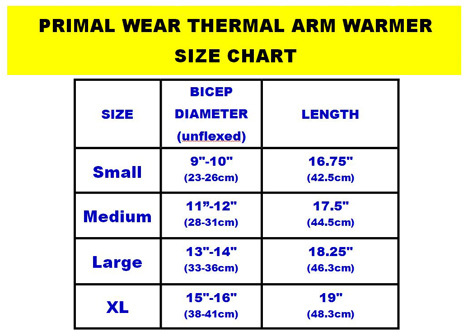 -Small reflective Primal logos on each arm warmer near wrist. $3.00 shipping (insured 1st class mail) to anywhere in the U.S. This includes APOs, Alaska, Hawaii, Puerto Rico and other U.S. territories. Most packages usually arrive in 2-5 business days. Other International Buyers: $5.00 for insured Airmail to Europe, Asia and Australia/NZ. Most packages usually arrive in 7-14 business days. We do not ship to ITALY, SOUTH AMERICA, THAILAND OR MEXICO because we have had too many lost shipments to these countries.